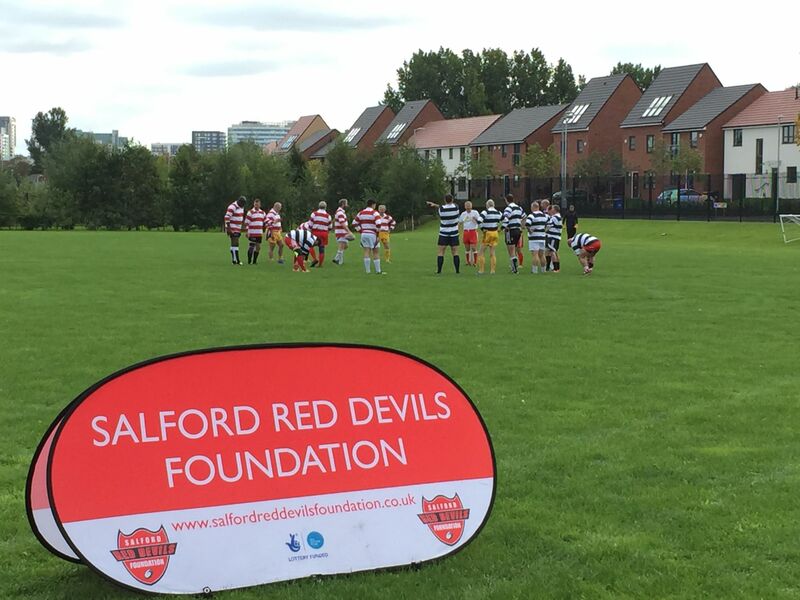 Salford Red Devils Foundation were proud to take part in celebration 120 years of Rugby League on Sunday September 6th. Guests headed to Riverview Primary school in Salford for a day of community celebration, particularly surrounding Rugby League. Salford Red Devils were not originally involved in Rugby League, later arriving in 1896, although Broughton Rangers were. Riverview Primary School is on the site of Broughton Rangers’ ground. The first ever game of Rugby League was between Broughton Rangers and Wigan Warriors. As such, there was a celebratory game between the two sides on Sunday. In addition to the game, a blue plaque was revealed at the site of Riverview Primary to commemorate the 120 year milestone, alongside various family-friendly community activities. The day was a great success, bringing together members of the local community particularly those with a love of Rugby League. The Foundation staff were honoured to be a part of Rugby League history. For anymore information on the work we do, or to find out about our latest news and events, follow us on Twitter @SRDFoundation or find us on Facebook.